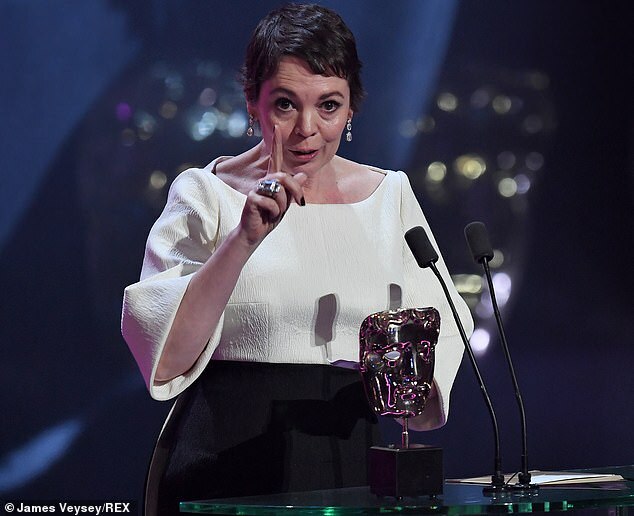 Olivia Colman proved she was true to her word as she made an unsteady exit from a late night after-party on Sunday evening, hours after vowing to celebrate her triumphant night at the 72nd British Academy Awards by getting drunk. 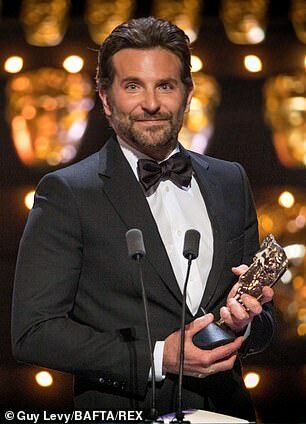 The celebrated actress, 45, was justifiably bleary eyed as she left London’s Grosvenor House with husband Ed Sinclair after celebrating a triumphant night at the annual awards ceremony. 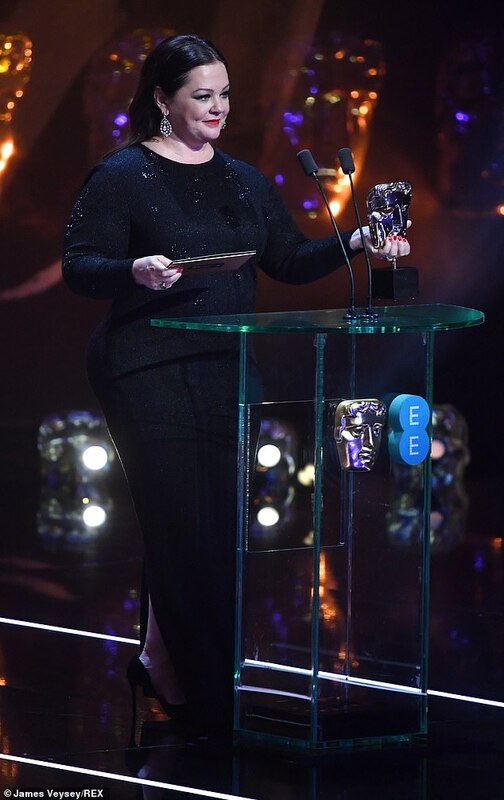 Olivia was named Best Actress for her role as a reclusive Queen Anne of Great Britain in The Favourite, with the film winning seven awards in total throughout the night. 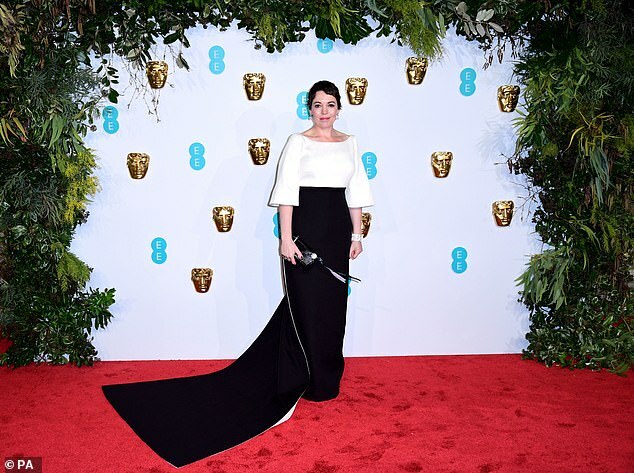 Looking suitably regal in a sweeping black and white gown, the actress – who will also play a middle-aged Queen Elizabeth when HBO show The Crown returns later this year – the star was in high spirits as she made her way towards a waiting car. Chaperoned by a security guard, Olivia gave waiting onlookers a beaming smile ahead of the journey home. 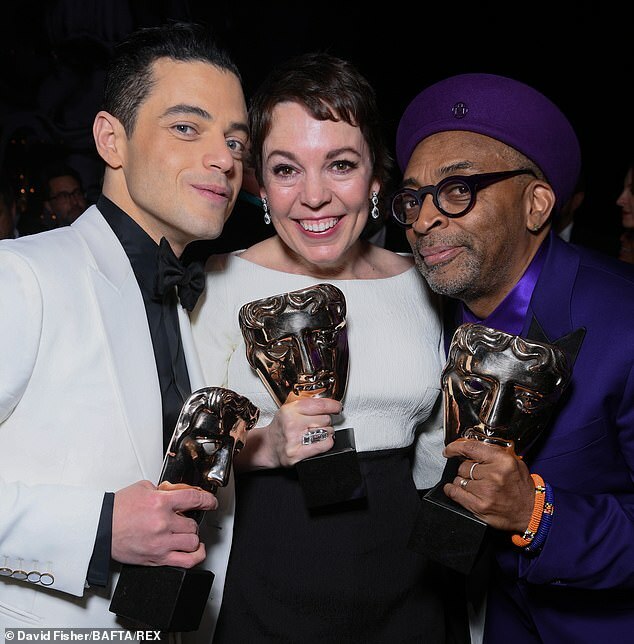 The appearance capped a successful night for the actress, who veered away from royal demeanour in her emotional acceptance speech at the Royal Albert Hall as she promised ‘to get so p*****’ with a few celebratory drinks. 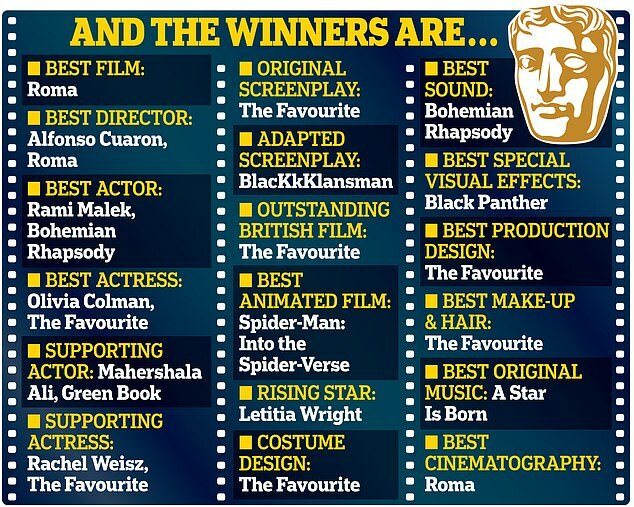 The film about the eccentric 18th century British monarch, which now seems bound for Oscars glory, was beaten to the best film prize by Mexican drama Roma. 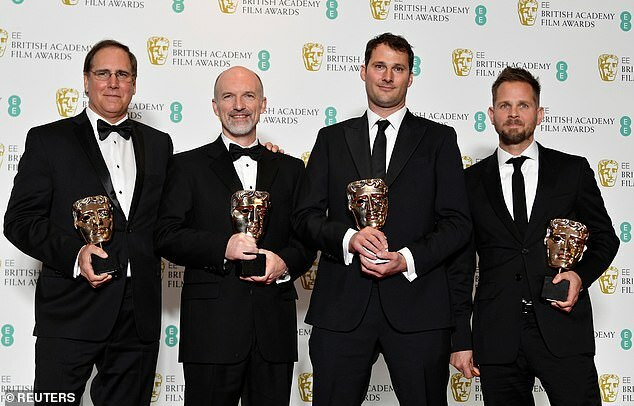 The film’s Greek director Yorgos Lanthimos said: ‘We made a very British film, the story is very British. 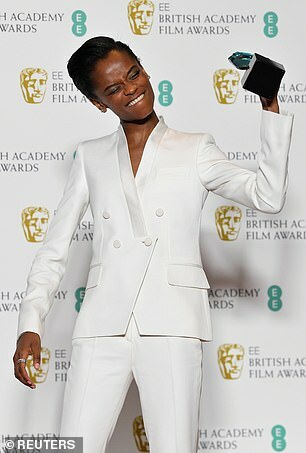 I don’t know what else to say about Olivia, she’s just an amazing human being, actor and she’s a joy to work with. 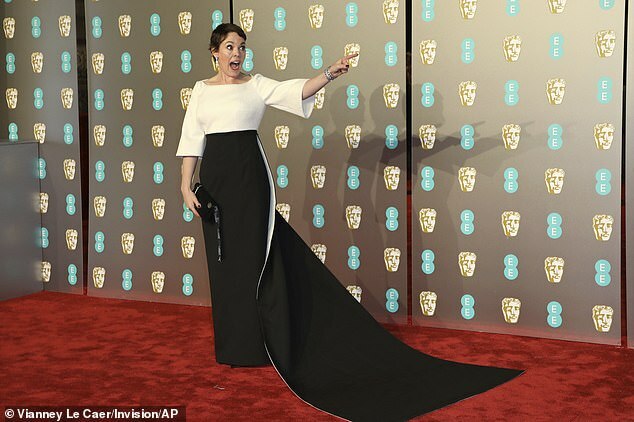 Olivia Colman was up for a Best Actress BAFTA Award, but she should be nominated for her gorgeous outfit too as the actress wowed in this bespoke Emilia Wickstead dress, as styled by Mary Fellowes. Inspired by the latest collection, the monochrome design lends itself to a classic Hollywood look. We love the column silhouette, boat neckline and loose sleeves, all of which flatter the figure. 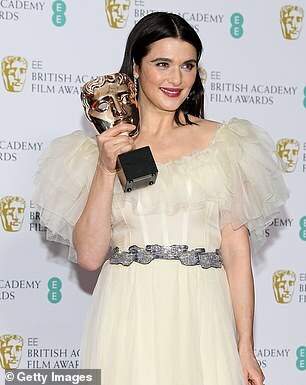 Plus, the fishtail skirt adds some drama to the whole look, which she completed with a pair of Jimmy Choo ‘Helix’ shoes. The dress is unavailable to buy, but the current collection is all yours to shop at NET-A-PORTER. Alternatively, emulate Olivia’s look in one of our picks below including Jessica Wright, Asos and Quiz. 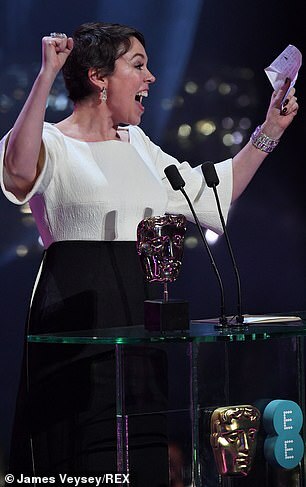 During her speech she said: ‘To be in the same company as my fellow nominees is simply extraordinary. I’m very shaky and card read this, sorry. 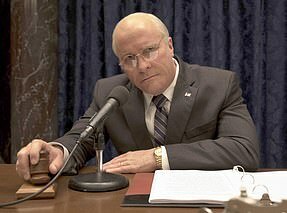 We’re having an amazing night aren’t we? 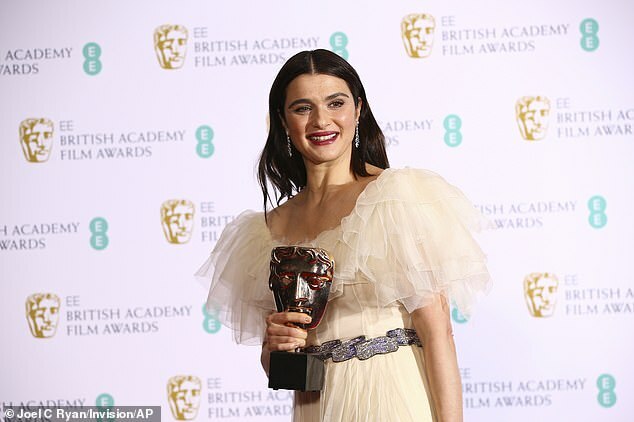 Earlier in the evening Rachel Weisz put on an emotional display with her co-star Olivia as she collected the prestigious gong. 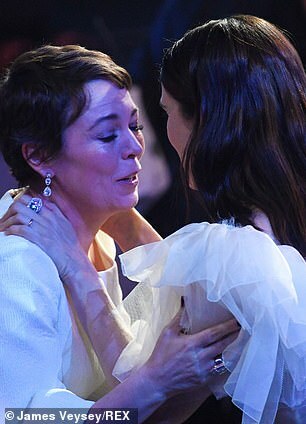 Olivia, 45, looked delighted with her friend’s achievement, as they shared a sweet kiss as she congratulated the actress for winning the sort-after award. 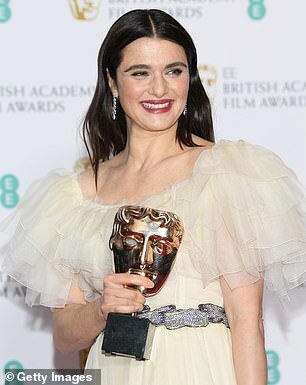 Rachel looked much younger than her years as she sported her dark chocolate brown tresses slicked behind her ears, while her features were enhanced with rosy blusher and deep pink gloss. 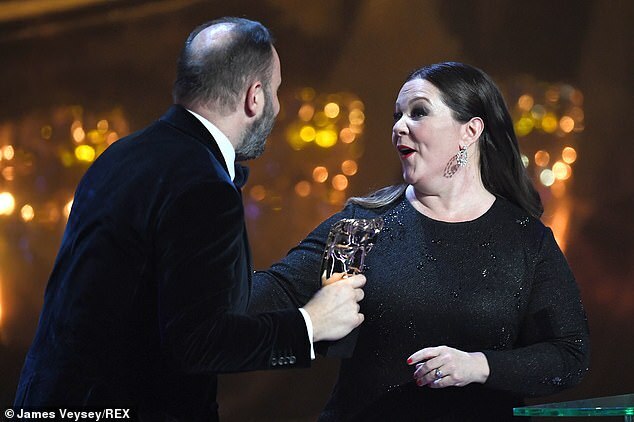 As she collected the award for Best Supporting Actress, Rachel said: ‘I played this opposite two of the most glorious women, Olivia Colman and Emma Stone, and didn’t we have the most glorious time? 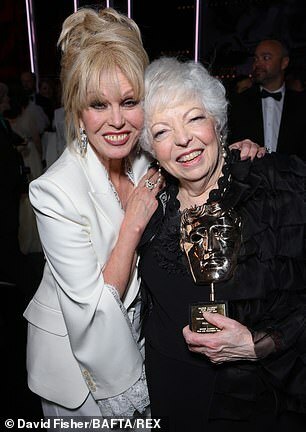 Hats off to you ladies!’. 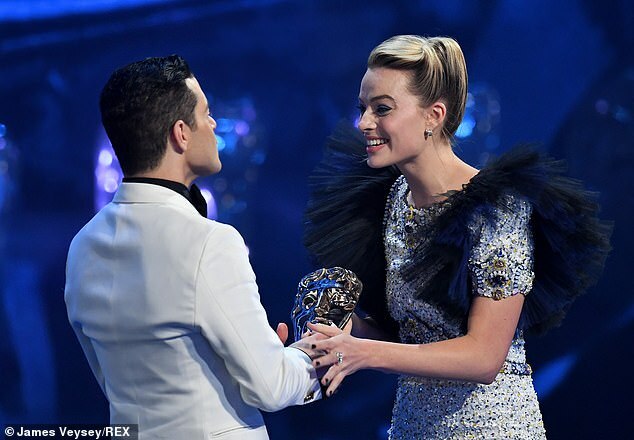 Speaking about their on-screen kiss, Rachel said they were very unprepared: ‘My mouth met hers and our lips opened and there’s not really preparation involved in kissing someone I don’t think. 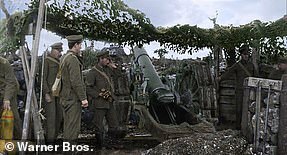 I don’t know of any. 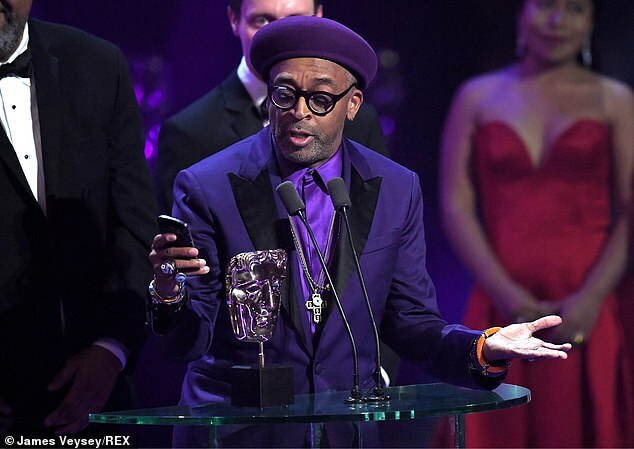 ‘It’s an extraordinary piece of writing. 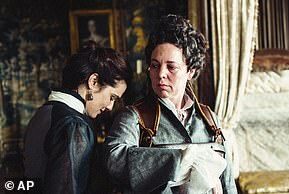 They’re both just so extraordinary the whole cast there’s too many people to make,e the main story is this three women it’s just a joy everyday to watch and work. 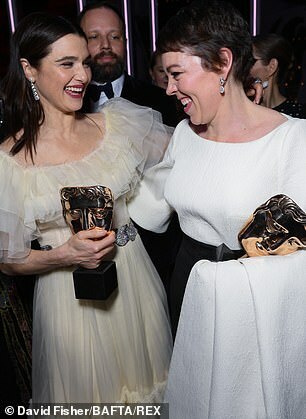 We had alo fun. 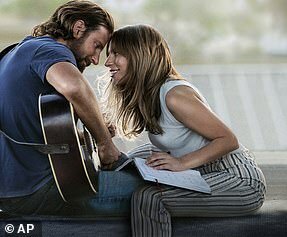 ‘I didn’t know when we saw the final film that it was going to be a tragic love story, I think he faced all those challenges he just allowed us to play our parts. ‘A challenge I just remember the dance that Joe and I did. 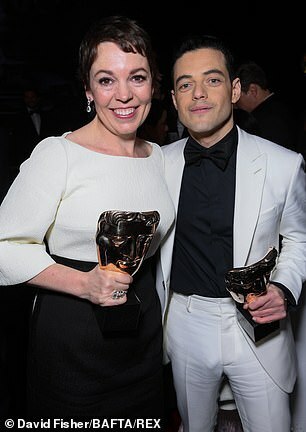 I’ve never danced professionally, before so it was quite a complicated dance to learn, but when I saw the finale film I saw the scene was really about the queen, she realises she’s wheelchair bound and has gout and frail and watching her face turn from enjoyment to envy to utter tragic pain is just she’s such an extraordinary actress. 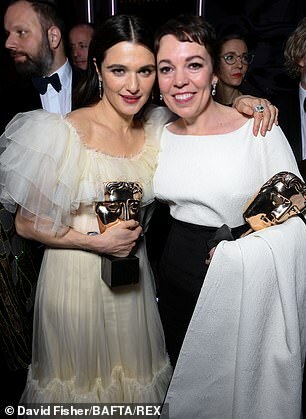 The Crown actress looked effortlessly chic in an Emilia Wickstead monochrome gown with a stunning empire neckline and two-tone white and black effect as her film The Favourite picked up seven gongs. 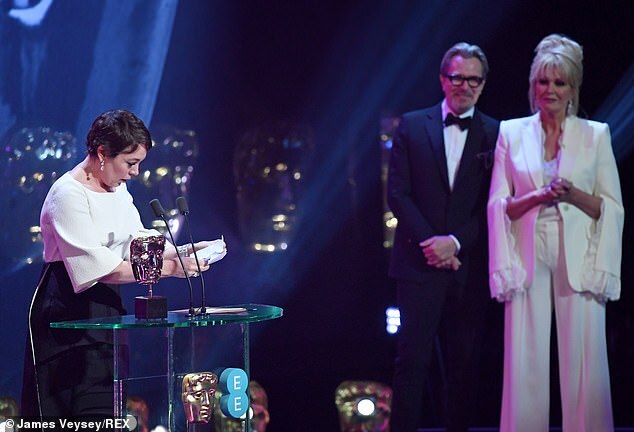 Olivia accessorised her simple but effective ensemble with a chunky glitzy bangle and a pair of dainty jewel drop earrings, while toting a black leather clutch bang in her hand. 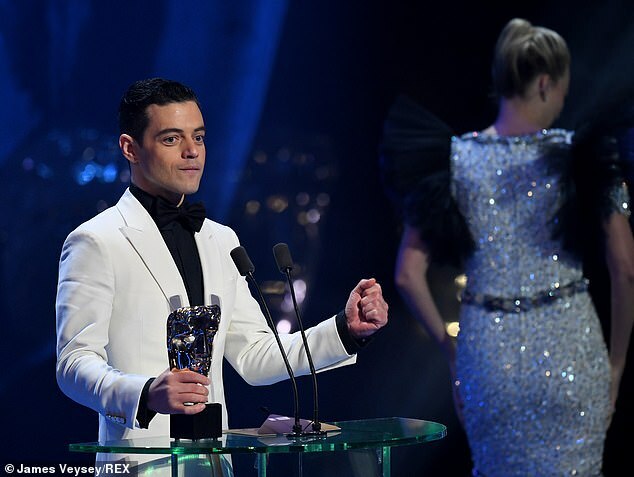 Rami Malek was awarded the Best Actor gong, as he took to the stage wearing a sharp white suit and thanked Freddie Mercury as he address the ceremony. 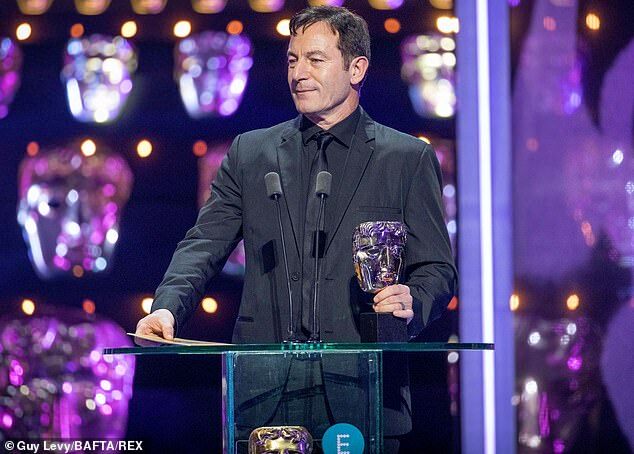 He gushed: ‘I can’t believe am I included in this group of actors, I’ve entered this world, as an outsider you Brits do it so well and it’s not lost on me how sacred your musical heritage is, so thank you so much for including me. 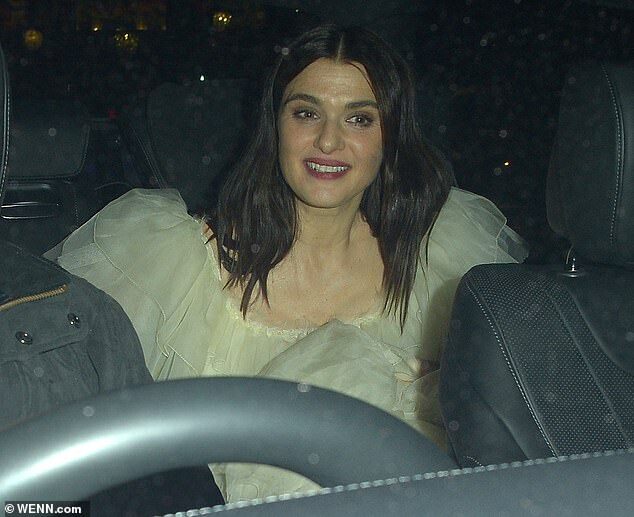 Olivia appeared radiant as she showcased her glowy complexion, wearing a glamorous coat of make-up with lashings of mascara and eye-liner and a glossy lip. 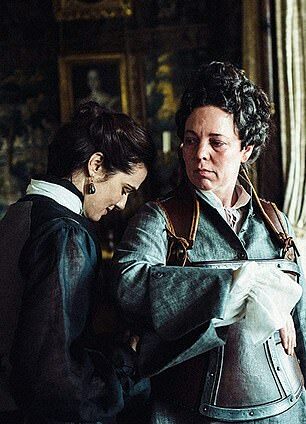 Yorgos Lanthimos’s The Favourite has swept the nominations with 12 nods in top categories including a Best Actress chance Supporting Actress and Best Film and managed to take home over half of its nominations. 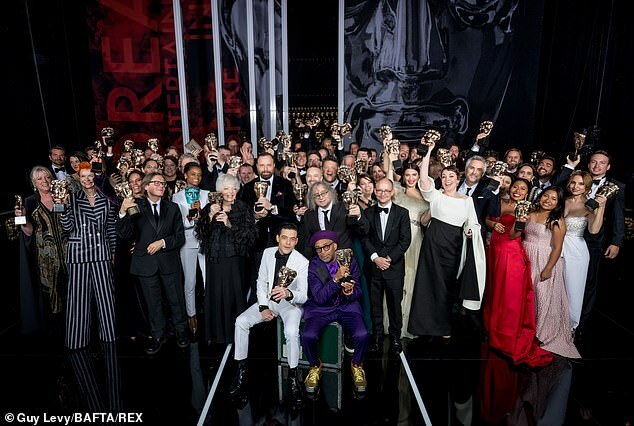 Netflix drama Roma took home the top prize at the awards ceremony, pipping other nominees BlacKkKlansman, The Favourite, Green Book and A Star Is Born to the Best Film post. 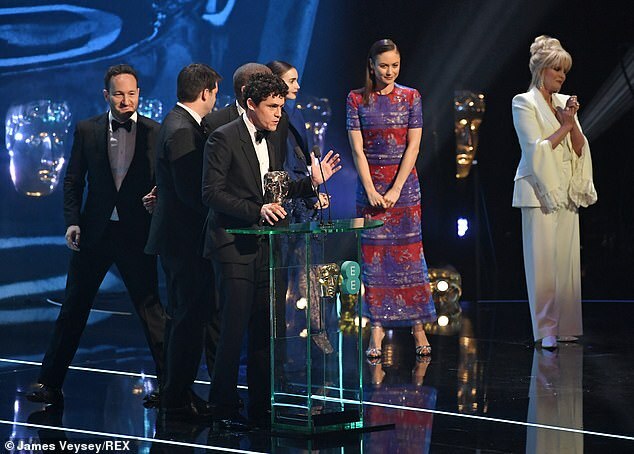 Taking to the stage alongside the whole of the Roma cast, the film’s director Alfonso Cuarón said: ‘This time I’m going to read because as you can tell, I blanked and can’t think what to say. 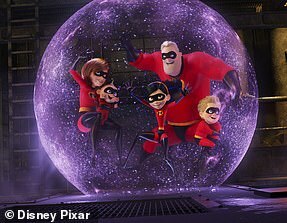 Spiderman: Into the Spiderverse, which has previously done well at earlier awards ceremony’s, was given the Best Animation accolade at the glitzy awards ceremony. 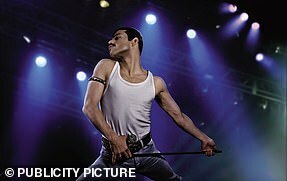 The audience were treated to a spectacular display from Cirque du Soleil, who wowed crowds by performing a series of expertly executed tricks as performers shot up into the sky. 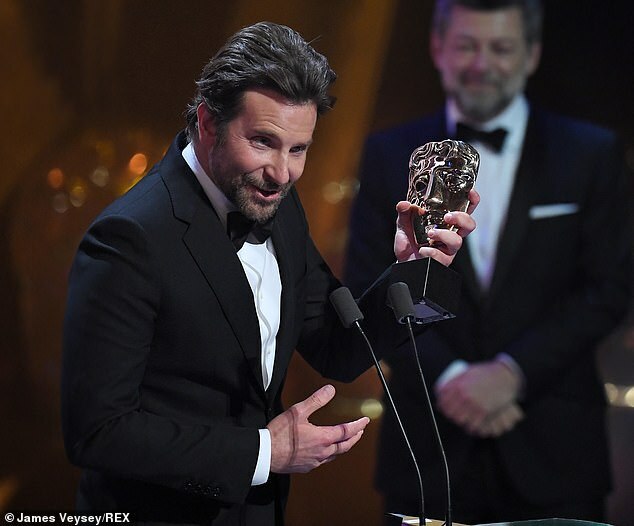 Bradley Cooper looked dapper as he picked up the award for Best Soundtrack for his directional debut, A Star is Born, where he credited his wife Irina Shayk and his leading lady Lady Gaga. 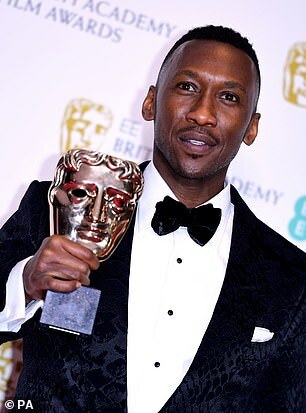 The Black Panther star took home the honour at the annual awards ceremony, Speaking to accept her prize, she said: ‘A few years ago I saw myself in a deep depression and I wanted to quit acting. 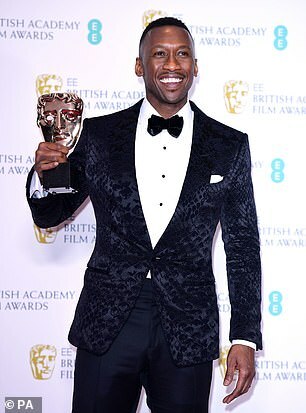 ‘The only thing that pulled me out of that was God, my belief, my family, and an email from BAFTA telling me they wanted me to be a part of BAFTA Breakthrough Brits and it inspired me to keep going. 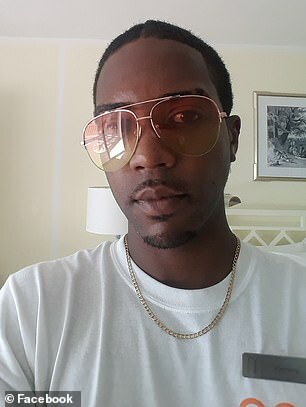 I’m still a work in progress. I want to encourage young people – matter of fact you don’t even have to be young – anybody that is going through a hard time, God made you and you’re important. 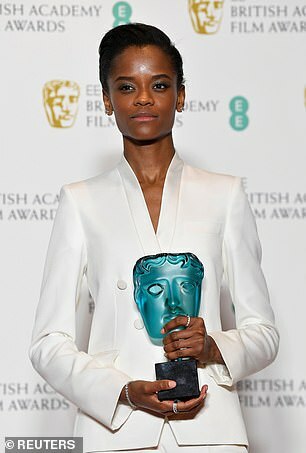 Let your light shine.’ The 25-year-old actress beat fellow nominees Barry Keoghan, Cynthia Erivo, Jessie Buckley and Lakeith Stanfield to the crown.